New! deluxe 67mm wide angle lens professional HD. High definition super wide angle lens with macro. 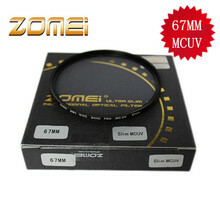 Works on ALL Cameras & Camcorders with 67mm size Lens Filter thread!!!. 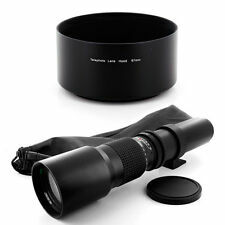 67mm 2X Telephoto Lens for Canon PowerShot SX500 IS 16.0 MP Digital Camera + Filter Adapter + More!! This 2x Telephoto Lens is a great addition to any SLR Lens or any camera with a 67mm thread.Doubles your optical zoom. Bring your subject closer with ease.Lenses include a LIFETIME WARRANTY!FREE Microfiber Cloth And LCD Screen Protectorsa with every purchase! Kit Includes: 67MM Vivitar Filter Kit (Ultraviolet UV, Circular Polarizer CPL, Fluorescent FLD) + Vivitar Macro Close-Up Set (+1, +2, +4, +10) + Filter Carry Pouch + Tulip Flower Lens Hood + Center Pinch Lens Cap w/Cap Keeper Leash + MagicFiber Microfiber Lens Cleaning Cloth. 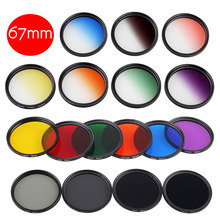 Filter Kit: Protect your camera lens from ultraviolet light while boosting your artistic possibilities with this Essential filter kit. 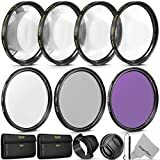 The kit--which includes an ultraviolet filter, circular polarizer, and FLD filter--is an ideal accessory for cameras Close Up Filter Set: Multi Coated 4 piece Close-up Filter Set consisting of +1, +2, +4 & +10 diopters. This is the perfect, economical alternative to a macro lens. Close-up filters offer a world of new and creative possibilities. They work well with both traditional & digital cameras. The set comes with a handy carrying case.Wide Angle Lens: The camera's angle of view multiply the camcorder, digital/video camera by 0.45 times, which more than doubles the angle of view of the camera. Great for landscapes or recording in situations where a little creative curvature of field , it is wanted for a certain style. 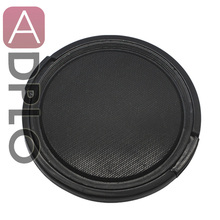 This excellent lens can be separated in two pieces (unscrewed): macro part and wide angle part. 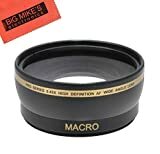 So you can use it both ways: like macro lens (without wide angle part) and like wide angle with macro together! This is a very unique feature of this lens for its price. So for the price of only ONE lens you are getting TWO! Professional 0.45x Super Wide Angle Lens *0.45X Professional Deluxe High Definition Super Wide Angle Lens *Built-in MACRO lens for extreme close-up shots *Digital SLR Pro Lens *Professional High Definition: PHD Lens reduces glass flare & ghosting caused by reflections *Special Element Frame: Special matte aluminum satin finish frame reduces reflections & optimized photography *Premium Rimmed Glass: High quality rimmed glass reduces light reflection around lens edge *Infrared Compatible: For high resolution day & night recording2X Telephoto Lens: This 2x Telephoto Lens is a great addition to any Camcorder, or SLR Lens, or any camera. Doubles your optical zoom. Bring your subject closer with ease.